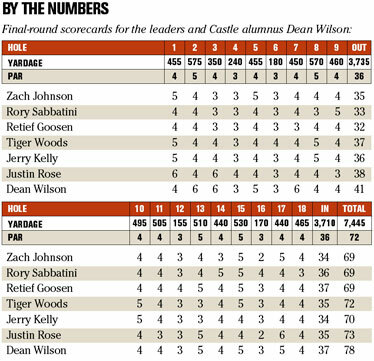 AUGUSTA, Ga. » Dean Wilson knew after seven holes yesterday that he wouldn't be finishing in the top 16 of this year's Masters field to earn an automatic invitation for 2008. If anything, he'd be lucky to escape the cellar if he continued on his current path. But after soaring to 6 over for his round with a bogey at 2, a double at 3, a bogey at 5 and another double at 7, Wilson dug deep into his golf bag to play even par the rest of the way in his last day at Augusta National, including the famed Amen Corner on the back nine. He survived his own train wreck to shoot a final-round 78 for a closing 13-over 301 and the tie for 30th that went with it. Had he managed to shave five strokes off that total, he'd be receiving an invitation in the mail without having to do anything else the rest of this PGA Tour season. Yes, he was disappointed with his performance. He knew being tied for 16th after the third round meant nothing in the grand scheme of things. 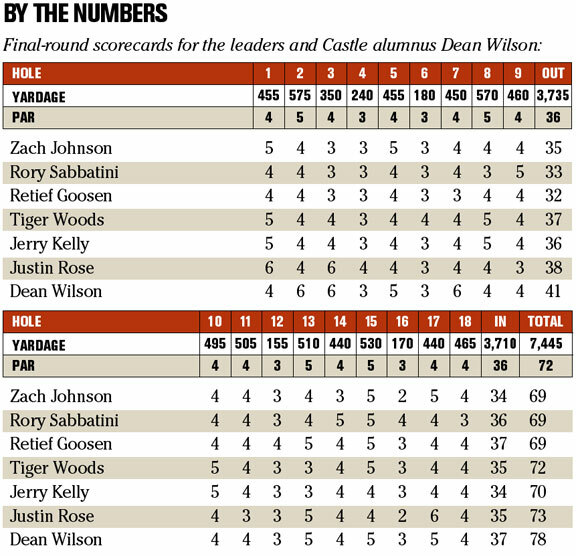 Wilson figured he'd have to shoot close to even par just to get a whiff of the upper echelon of the leaderboard. And he was right. "I knew I had 18 more holes," Wilson said when asked if he thought about being in the top 16. "I was just trying to concentrate on one shot at a time and wherever the chips fall at the end. It's just so difficult, you know. You can hit good shots and keep walking away with bogeys on every hole. Just because you hit good shots, doesn't mean you're going to par or birdie." The magic number was 73, something he let slip by after three-putting at the par-5 second from 15 feet, then needing three chips from two different sides of the No. 3 green just to get a shot at a double-bogey 6 from 8 feet. After knocking his approach into a deep bunker at the par-3 fourth, Wilson told his caddie, "We're looking at another double bogey right now," a weary smile crossing his face. As it turned out, he got up and down for par, but proceeded to bogey the fifth with a three-putt from 50 feet, then let a 6-footer for birdie slide by the hole at the par-3 sixth, before doubling the seventh, thanks in part to blasting out of one bunker just short of the green and watching it roll back into an adjacent bunker 2 feet away. He pounded his club into a strip of grass that separates the two huge bunkers that guard the seventh green religiously. After finally getting out and settling for his fourth double bogey since taking his first tour of the Masters course on Thursday, the 37-year-old finally saw the light with a birdie at the par-5 eighth. Was it a gut check? "Noooooo, it's just such a test out here," Wilson said. "Anything can happen. I just kept doing the best I could coming in and work on every shot like I did the first seven holes. You can make double bogeys real quick." Fortunately for Wilson, those holes were behind him. Instead, he began a string of pars from the ninth right on through to the famed 16th, where he let another excellent birdie chance from 8 feet slide past the hole on a wicked left-to-right break that resembled a Nike swoosh by the time his putt came to rest. He knocked it in for par, but the disappointment was evident as he shook his head in disgust for blowing his final realistic birdie opportunity. "On 16, I just played defense on that," Wilson said of the tricky putt. "I just tapped that thing trying to get it going the right speed going down. I still ran it by 3 feet. I don't know what else you can do. If the ball ends up on the wrong side of the pin, you're in trouble." Wilson hit the fairway on Nos. 17 and 18, but his second shot at the 17th skipped through the green, leaving him a delicate chip downhill that resulted in a tap-in for bogey. His demise on the front nine yesterday actually began with a double bogey at the closing hole on Saturday, something that didn't sit well with him as he slept that night. He closed with a par at the 18th yesterday after two-putting from 55 feet, much to the delight of the patrons, who gave him a rousing ovation as he completed his first Masters with a par putt from 5 feet. A wry smile crossed his face, but he conceded after signing his scorecard that he wished he'd managed a better start. "Can't do that," Wilson said when asked if he'd like to play those holes again. "I just had a tough day, tough start. It's a great experience being here, being in the field, making the cut and then playing late in the day. It's awesome. It's just a very, very tough test of golf out there. "This is where you want to come and play. Believe me, you can't win the Masters without being in the field. It doesn't look like I qualified for it, so I'll have to do it another way. I'd love to finish in the top 30 of the money list again, that would be great."